Ensure all students master content by designing and implementing a personalized competency-based education (PCBE) system. This handbook explores approaches, strategies, and techniques that schools and districts should consider as they begin their transition to a PCBE system. The authors share examples of how to use proficiency scales, standard operating procedures, behavior rubrics, personal tracking matrices, and other tools to aid in instruction and assessment. 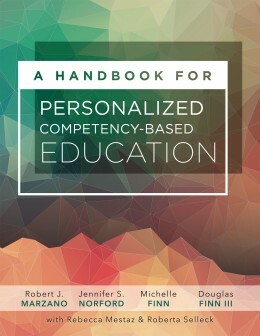 Determine what content to focus on and what standards to prioritize in a PCBE environment. Learn how a flexible PCBE learning environment can foster self-efficacy. Understand the variety of assessments available for measuring student proficiency. I can’t tell you how much I love your handbook! Prior to reading your book, I was beginning to feel overwhelmed and uncertain of the path we needed to follow in our transition to a competency-based system. Now with your book, I have a new outlook! As a matter-of-fact, I was so excited after reading it that I ordered a copy for each of the administrators in our district and their responses have echoed mine. One administrator said, “We have to get this book into the hands of our teachers!” as it offers valuable information on student agency, instruction, and assessment. At the end of our 2016-2017 school year, we committed to creating a two year plan that would be shared will all district staff at the start of the 2017-2018 school year. I had a vague idea of what our plan should consist of, but I wasn’t 100% confident. As I read your book, A Handbook for Personalized Competency-Based Education, I began writing down a list of the steps we missed in our competency-based work during the 2016-2017 school year and when I made it to the final chapter, I had a comprehensive two year plan! Thank you so much for writing a book that provides the content and tools needed for schools and districts moving to a competency-based system! I only wish it had been written a year earlier when we began our journey!